When people think about buying insurance, they might not always think of promotions or discounts. This is because insurance is not a tangible good. However, there are plenty of ways to save money, many of which you may have never thought of before. It’s in your best interest to shop around for the best auto insurance discounts and get cheaper coverage. Why Do Insurance Companies Offer Discounts? Like any other business, insurance is highly competitive. It is in the best interest of the insurance companies to offer discounts to the best drivers. They are the ones who provide a minimal risk that a huge payout or claim will ever be made. People who have few or no vehicular accidents and file fewer claims will tend to be rewarded by the insurance company by way of cheaper rates. There are many things that go into determining the amount of the discount, such as the distance you travel to and from work and the number of young people on your policy, but the savings can add up. Some states require discounts to be given by insurance companies to drivers who meet certain criteria. The most common of these would include taking a defensive driving course. Another one is driving some years without a major accident. It is also important to better understand how insurance companies calculate the rates for their premiums, including the various risk factors that they take into consideration. To begin, an insurance company will typically issue you a base rate based upon your various risk factors. The criteria include things like a drivers age, vehicle being insured and the length of time that you have been driving. Surcharges can then be added on to that based rate. This depends on whether or not you have tickets or fines on your driving record and how many accidents you have been in. The number of claims that you have filed in the past will also play into your surcharged rates. These are just a few of the factors that can lead to additional charges being added to your base rate. At the same time, discounts can also be offered. This will cause your base rate to decrease based on a variety of factors. Perhaps you have attended and passed a defensive driving course. You could also have a number of safety features in your car that decreases your overall risk of being seriously injured in a crash. If you are a great driver, discounted premiums will almost certainly come your way. This will decrease the base rate of your premium. To summarize, your final premium will be calculated as you base rate plus any applicable surcharges, and minus and available discounts. Bundling Discount – Car insurance is not the only coverage that you will typically need. If you agree to use the same insurance provider for all of your policies, you can bundle everything with one insurer. You will often be given a discount off the premium of each. This will end up costing you noticeably less money than if you were to purchase each policy separately from different providers. Club Membership Discount – It can pay to belong to a club or association. These include auto clubs and credit unions. They often work out various discounts with specific insurance providers if you agree to use them. This is a good incentive for the ins provider because they will be promoted exclusively by the club or organization. This, in turn, makes it more likely that members will choose them for their auto insurance needs. In exchange, they will provide with a certain percentage discount off the premium. 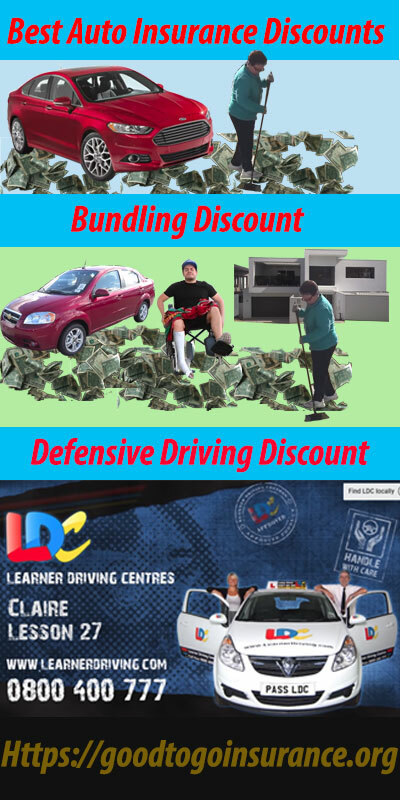 Defensive Driving Discount – Take a defensive driving course, and many insurers will provide you with a discount as a result. This is because you are perceived to carry far less risk, as a result of the knowledge that you have obtained from the class. The deduction can be as much as ten percent off your monthly premium. Equipment Discount – Not all cars are created the same, and this goes for safety features. If the vehicle that you drive comes with certain approved safety features, the insurance company will give you a rate break in many cases. It does depend on the type of equipment, but you can also install these items after you have purchased the vehicle. The ins agent may ask to visually confirm that the safety equipment is present in your car, but this worth it in order to get the discount and be safer at the same time. Good Student Discount – Young people who earn good grades in high school and college are seen to be a lower risk when it comes to pricing policies. Encourage your children to get good grades, as this case results in a savings of up to twenty percent in some cases. Good Driver Discount – This discount comes about from demonstrating a consistently clean driving record. You would think that every carrier offers this discount, but strangely, not all of them do. You will want to shop around and make sure you find a company that does. This could save you up to twenty percent off your base premium. Coupled with this discount are usually other factors, such as where you tend to park your car and the distance that you drive to and from work. Each deduction is worth pursuing, as you want to get the lowest rate possible. Low-Mileage Discount – If you can demonstrate that you do not drive that much, you can become eligible for a low mileage discount. The rationale here is that you are at less risk of an accident if you do not drive that much. This is also an area that you want to evaluate each time your premium comes up for renewal. If you have changed jobs, for example, you might find that you now qualify for lower rates. This is because you are much closer to home than when you first bought the policy. This discount can be as much as ten to fifteen percent, so make sure you take advantage of it id you don’t drive much. Military Discount – Members of the military often qualify for a discount on their auto insurance, so make sure to shop around see what carriers offer this. You can check out Goodtogoinsurance for specific insurers who give discounted rates to active military and veterans. Most insurers extend the savings to immediate family members as well. Some companies will also offer it to military retirees, so make sure to check on that as well. Multiple Car Discount – If you agree to insure more than one of your vehicles with a company, you may be offered multiple car discounts. Two cars, for example, might be insured for less than the cost of one based on a number of factors. Ask about this deduction if you are going to insure more than one vehicle at a time. Payment Method Discount – How you pay can often determine the amount of your discount on car insurance as well. You might save some money if you agree to make automated payments, right from your checking account, or credit card. Ask for any applicable discounts and then see if it fits within your budget and how you typically pay your bills. The discounts represented here to act in a cumulative manner. The more you qualify for, the more you can save off your car insurance premium. Bundling and multi-car savings can knock off a significant portion of your overall cost. Others might only save you a percent or so, but every little bit counts. Also, keep in mind that not all discounts will apply to your entire insurance bill, as some might only be applicable to one part of your coverage, such as personal medical. Since this is a small portion of your entire car insurance policy, you might not notice much of a saving there. Many companies will often limit the amount of total discounted items that you can apply to one policy. This cap is usually set at around twenty-five percent. Your location often determines how much you can save, as some discounts are found to vary in certain parts of the country. By now, you should be able to see that discounts can add up to big savings. The trick is qualifying for them in such a way that does not cost you money, but rather saves you a lot. You don’t want to buy a more expensive car with the latest GPS alarm system, just to save a few bucks off your insurance. However, you would want to take that defensive driving course, as it would be money well spent. Consider the following five pieces of advice that will help you get the cheapest policy possible. Understand the discounts available to you – One recent survey estimates that only twenty percent of drivers today are taking advantage of available discounts on their car insurance. Remember that the insurance companies will not necessarily volunteer this information to you, as they want to get as much money out of you as they can. Instead, you want to be informed and ask about every discount that you qualify for. You can take this list with you the next time you meet with your insurance agent. You can also apply for discounts at sites like good to go insurance online, which is a lot faster. Ask about them one by one and see how much of savings you can get. You might be amazed. Do comparison shopping each year – Just because you have been with an insurance company for years does not mean they are going to reward you because of your loyalty. On the contrary, they may not even be offering you any rate-discounts. Do not be shy here. Call around and ask about the discounts offered by other companies and see how they compare to your current policy. You could be shocked by the disparity, regarding what is offered to you. Do this rate comparison test every year if you want to maximize your savings. Do not become fixated over discounts – Discounts are great, but not if you have to go out of your way to qualify for them. This is especially true if you will need to spend money just to qualify. Safety equipment, for example, can be expensive. The amount saved might not outweigh the cost of the equipment in the first place. Do not buy a second vehicle just to get a multi-vehicle discount. You get the idea. Look for concessions that are easily available to you. Never become so fixated on them that you lose sight of the big picture. Pay upfront and save – Many people pay monthly for their car insurance because it fits better into their budget that way. When you do that, insurance companies tend to charge a bit more. This is because they must manage your account to make sure that you are consistently paid up. This is why many insurers will offer a nice discount, often as much as 3 percent, if you pay the entire premium up front. If you can’t pay a year up front, consider automatic payments and paperless billing, as this could result in a 1-2 percent discount. Purchase only what you need – Take a close look at what your insurance company is offering you. Pay only for what you need. Remember, there will likely be some parts of your insurance coverage that you are required by laws in your state to maintain. Beyond that, the choice is up to you. This guide is designed to help you save money on your car insurance. Remember to look for the best auto insurance discounts that you qualify for. This is a quick and easy way to get your premiums reduced. In the end, remember to shop around for the lowest rates and stay insured for less.